The final draft of GST laws has been tabled in the Lok Sabha for discussion on 28.03.2017. It is quite certain that the revolutionary taxation reform will be a reality by July, 2017. The government has officially released two drafts of proposed GST Act till date-one in June, 2016 and the other in November, 2016 and has placed the laws in the public domain for suggestions by experts, trade and industry. The proposed GST law has been further refined every time with certain new provisions. 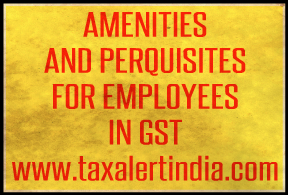 The present article attempts to analyse the taxability of transactions between employer and employee in the proposed CGST Bill, 2017. (vii) together they directly or indirectly control a third person; or they are members of the same family. 3. It is observed that the definition of related person is very wide. Employer and employees are also considered as related persons. Consequently, any supply made by the employer to employee will be treated as supply, even if made without consideration as per the provisions of Schedule-I. However, exemption has been provided for gifts not exceeding fifty thousand rupees in value in a financial year. Under the present service tax laws remuneration paid to directors was a matter of dispute all over India wherein it was alleged that exemption is only for services provided by employee to employer. However, the issue has been finally ruled in favour of assessee by accepting that the director pays income-tax on remuneration received from the company under the head income from salary and TDS is also deduced under section 192 of the Income Tax Act, 1962. Moreover, recent decision's given in the case's of SKN Organics (P.) Ltd., SKAN Research Lab (P.) Ltd. v. CCE, Puducherry [2017-TIOL-602-CESTAT-Mad.] also confirm that, although no service tax is payable on the remuneration paid to directors, yet if service tax has been paid by the company under reverse charge mechanism, its credit cannot be denied to the company. 4. It has been interpreted that the amount paid by employer to employee in lieu of services rendered by the employee and which is explicitly mentioned in the offer letter or agreement is exempted from the levy of service tax. However, one may say that every payment and every benefit given by the employer to his employee is part and parcel of the services provided by employee, as nobody will make payment without receiving anything in return. But the interpretation that every payment and benefit paid by employer to his employee will be exempted from levy of tax cannot be accepted by the government. Consequently, the proposed GST Law speaks about levying GST on supplies made by employer to employee exceeding value of Rs. 50,000/- in a financial year. However, it is practically difficult to say whether such supplies have been made as per the employment agreement or otherwise, as at times there is no written agreement determining the benefits admissible to an employee. Moreover, certain supplies are impliedly made and are not agreed upon formally, say Diwali Gifts, Gifts on organisation achieving targets or gifts given casually. Considering such implied gifts, the value of Rs. 50,000 in a financial year appears to be low. Furthermore, perquisites not formally mentioned in the employment agreement may also attract GST. For example, if a chain of hotel throughout India provides free stay and free food to its employees and his family as a goodwill gesture and if this perquisite is not specifically mentioned in the offer letter of employees, it will tantamount to supply of service attracting GST. Another example may be that of Railways providing free travel benefits to its employees without any explicit agreement and. In such cases the value limit of Rs. 50,000/- may appear to be very less. 5. The provision regarding levy of GST on supplies made by employer to employee exceeding value of Rs. 50,000/- will definitely invite litigation as firstly, there will be dispute as to whether such supply was made in lieu of providing services by employee or not and secondly, the valuation of such supply will also be debatable. This is for the reason that the employer and employee have been considered as related person. In such cases, the revenue authorities have the power to challenge the transaction value. As such, the employees presently enjoying amenities over and above their CTC without paying service tax may have to face the levy of GST in the days to come.